An old friend emailed this image and gave me permission to post it. The story is that, on her birthday in May, she looked outside and saw a Ground Squirrel who lives in her backyard looking at her intently. She was delighted and also puzzled because the Ground Squirrel seemed to be trying to communicate something. 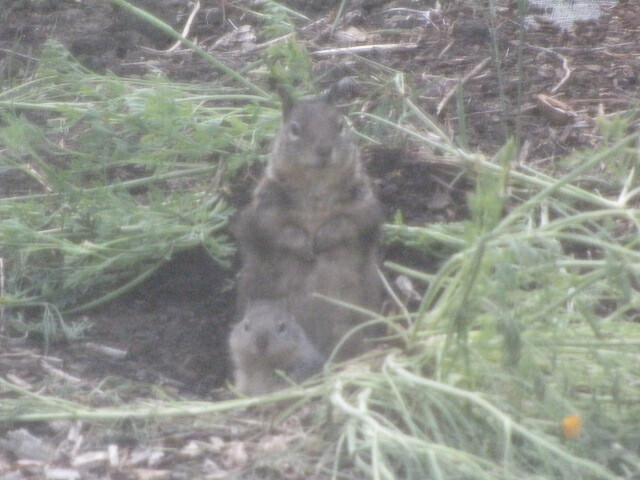 As she observed the Ground Squirrel, she was amazed to see a "fledgling" appear beside its mother! Labels: Ground Squirrel and "Fledgling"
great photo. maybe mama was trying to say, "hey, we're here, please leave us alone. look, here, I've got a young one!" Up pops junior. Love the look on both their faces. Taradharma -- Knowing the friendly communication my friend has with this Ground Squirrel, my guess was that mama was saying something else, too, "Happy Birthday! I have a surprise for you. My little squirrel child is fledging today! Thank you for your kindness to us!" Amazing, isn't it, that my friend was able to get her camera and take this photo without the Ground Squirrel and young one running back into their burrow? Beatrix Potter came to my mind, too. What a nice picture. What a great photo! Looks like the mom is saying, "Hey guess who's here with me? Isn't my baby a cutie?" That looks like a wise mother squirrel. She looks as though she wants to share her special secret.